As Charles Dickens died before completing his last novel, The Mystery of Edwin Drood, the solution to the mystery has remained a mystery! RCT’s April musical production of The Mystery of Edwin Drood preserves the mystery– and lets the audience every night offer some solutions! Now, RCT offers YOU the chance to write a final book chapter or on-stage scene for Edwin Drood! Four first-place entries will win RCT season memberships! The following is information about RCT’s upcoming production of The Mystery of Edwin Drood: The Solve-It-Yourself Musical. It includes background on the characters; the author, Charles Dickens; the composer, Rupert Holmes; a description of the story; other Dickens books; and a “scorecard” so that you can keep track of the motives of each character. At the end of the show, the audience chooses the ending—WHO IS THE MURDERER?? The newest venture at Richmond Civic Theatre is RadioWorks. This program will strive to cast, rehearse, then record a radio drama, to then be aired on WECI. The inaugural broadcast was the Christmas classic, A Christmas Carol. Now, RadioWorks takes a step into the world of sci-fi. 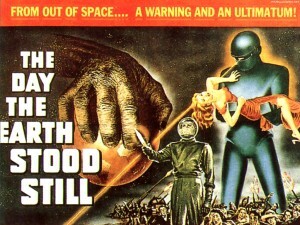 On Sunday March 8 at 2 pm, Director Kathy Clopper will hold auditions for The Day The Earth Stood Still. Rehearsals will be in the evening on Tuesday and Thursday, March 10 and 12. (Time TBT per cast schedules.) Rehearsal Saturday morning, March 14 at 9 a.m. and recording on Saturday afternoon at 2 p.m. There are “voices” for 27 people (21 male, 1 boy, 3 women, 2 either), so be prepared for lots of doubling/tripling. No memorizing–just lots of reading out loud. You MUST attend all four rehearsals and the recording session. This is the perfect opportunity for those who don’t want to memorize a script, or be in front of a live audience! Contact RCT for more information. Interested in The Three Musketeers? There will be no preview material available. Please look at the character breakdown and be prepared to “cold read” for a part on either Feb. 22 from 2-4 pm, or Feb. 23 from 6-8 pm. Shows: May 15, 16, 17, 22 & 23. Attached are materials that can be used by those classes reading The Great Gatsby. Wednesday February 4, at 1:30 p.m., at Morrisson-Reeves Library. Saturday February 7, at 2:00 p.m., at Friends Fellowship Community (in the Assembly Room). Wednesday February 11, at 1:30 p.m., at Centerville Library. The book discussions are free and open to the public. You do not need to read the book before attending. However, because “The Great Gatsby” by F. Scott Fitzgerald (1925) is ranked as one of the best American novels of all time, we certainly encourage reading it; and bring your copy to the discussion! Actors from RCT’s production of “Gatsby” will join the discussion and perform scenes from the play. February 5, at 12:30 p.m., at IU East in Whitewater Lobby. Join others for a complete reading of “The Great Gatsby.” It’s a short and dynamic literary classic, the novel that memorably captured the 1920s. Be part of the Gatsby party! Send us a picture of yourself reading Fitzgerald’s timeless classic, using #RCTGatsby on Twitter and Instagram. Then come to the show at RCT and find your picture in our Memory Room. February 6, 7, 13, 14 at 7:30 p.m. and February 8 at 2:00 p.m. The Lion, the Witch and the Wardrobe cast announced! After an astounding amount of young people turned out for auditions, the choices were very difficult! Because “THE MYSTERY OF EDWIN DROOD” is coming to RCT, is musically challenging (& wonderful! ), is not well known, but is such an excellent and fun musical production… before our auditions in December, we are going to have a MEET EDWIN DROOD Workshop for all interested performers!! On SATURDAY DEC. 6 at 1:00–3:00 p.m. Director David Cobine & Music Director Jon Hudnall will introduce you to the music, characters, story, theatrical style, & even a British speech lesson! The auditions will be on December 14 & 15. Audition materials are currently available at RCT.